I have never used G92 and I really don't know why I should. change to next tool and touch off and write the values in tool table. During tool change no G43 is used in this case. From now on I can use every tool just I must do a G43 after the tool change. Sure after you change material, you will have to set a new Z value, but I do this just setting the Z value of G54. so please don#t let my die, not knowing what is the advantage of G92. Is is just to have G54 exactly on chuck center and front of chuck? P.S. The only thing we need, is a button that writes the actual coordinates to toll table. There are many ways to skin a cat. We are coming from commercial controllers to Linux CNC and having operated 2 axis lathes with GE, Fanuc, Fagor, OpenCNC, Milacron and others I have never seen G54 used on a lathe.....We do use G54 all of the time on our horizontal and vertical machining centers and I am not saying it does not work but on lathes all we need is G92 or offset origin (these are the same in my opioion) and the button that writes the offset value to the tool table. We are currently using the Fanuc style patch and our programs are virtually identical to the $60,000.00 Fagor retrofit I had done on our largest turning center. I dont want to change this thread.....There is a thread in the gcode section that was started that describes the patch and our procedure. I did want to add th the Fagor does have a "Preset" button (offset origin or G92) and a tool calibrate button which puts the offset value in the tool table. I am not here to tell you what you do is wrong or to change what works for you. What you are using G92 for is exactly what it's for offsetting the origin. Just wanted to point out there is a different way to do it that may be easier or more straight forward. I also asked so that I understand what and why you were doing it. Yes linuxcnc's lathe concept doesn't quite go all the way. There seems to be some resistance to do that. Anyways I knew that toolsetting was a little short in Gscreen. You can edit directly the toolfile and the offset file - but this may not be convenient and probably requires some math - so error prone. I can add the tool offset button and we will see if that helps. Are you using the default Gscreen or 'industrial' ? Thanks for the good words about Gscreen - I am very happy with how it's working out. Norbert's Gmoccapy is proof others can build their own almost clean-sheet design. I predict more people will try linuxcnc if they can build a custom screen. Even OEM builders want a customized screen. SRT wrote: There are many ways to skin a cat. We are coming from commercial controllers to Linux CNC and having operated 2 axis lathes with GE, Fanuc, Fagor, OpenCNC, Milacron and others I have never seen G54 used on a lathe.....We do use G54 all of the time on our horizontal and vertical machining centers and I am not saying it does not work but on lathes all we need is G92 or offset origin (these are the same in my opioion) and the button that writes the offset value to the tool table. I might point out that regardless of whether you have access to it the other controls are using a coordinate system like G54. It's just you can't change it so the user ignore the fact there is one. 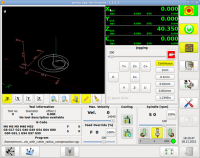 In linuxcnc even when using a lathe you can still change the user coordinate system. While using G92 you are using it in conjunction with G5x - really very similar to Fanuc - you just can't change to G55 etc. So how much did it cost to retrofit linuxcnc to your most costly machine? Just curious to compare - if the machines are comparable. Cost is one thing control over the whole process is why I have turned to Linux CNC. I buy the panels on Ebay or auctions, the mother board, hard drive, Mesa and MPG are around $2000.00 Give or take there is still about $12,000.00 in labor if you count your time and I have too being a commercial operation I am lucky I have Lair82 employeed and he enjoys this ( I Think). The Fagor was $56,000.00 with an outside contractor and new Motors and drives I would say $12-$14 for the third one we will be doing using existing motors and drives. To touch on the other points made, sure we can use offset origin no problem, the Fagor has a Preset Button we use. We are very in tune to the Milacron way I have 9 of them in my shop so we learned on very old controls that did not conform to anybodys way but theirs. My only point is that the front GUI's for Linux cnc are more slanted towaard mills than lathes. I hope to shed some light that us commercial lathe owners have never called a G43 to call for an offset or called a G54 cooridinate in a program the G54 screen or table does not exist on the lathe interface I have two Fagors in my shop 8055M and 8055T milling and turning the front ends are specific to the application. Please understand I have a shop full of machinists that just expect things to be a certain way no matter what control they have to operate. I am very happy with the progress and I am not attacking the application in any way, I am just hoping to get a few changes for us lathe guys. In time maybe we will try the custom front end but we are still in a fairly steep learning curve with Linux, and LinuxCNC....Thank you for the work you have done so far. Just having a button for the tool touch off applying to the tool table will be a big plus as we already got that process down in AXIS. Your interface is definately a move in the right direction for touch screen users like us. I added a tool touchoff button to the default Gscreen. it issues a G10 L10 on the current tool by popping a dialog asking for the reference value. I also issues a G43 after. This should be just like AXIS. Please test carefully and let me know if it works as expected. I need to do "git pull" from the terminal and re-compile right? Thank you for adding the tool touchoff button and Happy Easter. We do like the Gscreen for sure and after going back and reading my earlier posts I think i am campaining for the Fanuc style offsets more than anything the patch takes care of that we just got off track because the Fanuc patch language and the latest version of master did not match up and we are making a new build with GScreen for the firts time so not knowing how to touch off tools without entering the values directly into the tool table manually we were thrown for a curve for a day or so. I may have been confused on your Change Origin button thinking it automatically entered values into the G54 offset and forcing us to call a G54 in our programs the same as we would have to call the G43 if we did not use the patch. I will get more hands on Monday. I think I will start a new thread in the GCode section on the patch. Again thank you for your efforts and listening no matter how self serving I may have come off. LAIr82 yes git pull and then make. I would like to see the patch added too - I have an Okuma lathe that is in the middle of a very slow upgrade -I will want the patch for it. If the patch gets in then I will change the offset widget to show wear offsets too, I'm not sure how you are using it now. One of the nice things about Gscreen and it's variations is it is fairly easy to make small changes. For instance if you don't want the 'change origin' button because your using a lathe, you can hide it and replace it with a blanc button. Once you have all your machines running and get some time it might be something you would like to do - fine tune the display, if you will. The development of Gscreen, particularly the 'industrial' skin as been an open process and I think that has been good to push the design to a more natural to machinist layout. AXIS is a very smart design but it is not so good for touch screens (it wasn't built with them in mind) and is a little unintuitive compared to the way industrial machinists are used to. Luckily in linuxcnc we have many choices - Gscreen is just another. I am interested what others will build with Gscreens infrastructure. I'm very impressed with Gmoccapy.